Most of today’s living rooms are boring, and it has been a common misconception among homeowners that decorating this space costs a lot. 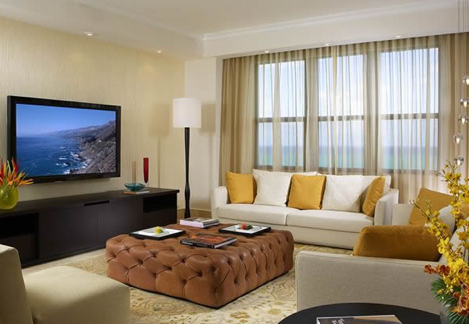 However, by just a few simple tips and tricks provivded by J Design Group, you can easily revive your living room. Use colorful pillowcases. If you want to add a splash of color to your living room space without making the whole area a chaos, then you may start with the little things first, such as the pillows. You can keep a solid colored sofa, but you have to use bright pillows (you can use printed ones) to add a contrasting effect to the furniture. Cover lights with frosted shades. Living room spaces usually become cozier because of the lighting. However, if you cannot afford to change your lights yet, perhaps you can add in frosted lampshades instead. You can purchase shades made of silk, or abaca straw, as these provide a warmer, cozier appeal to the living room. You can also get them in different colors so that you won’t have to change the shade of your bulbs. Cover windows with curtains of thinner fabric. Dark curtains make the living room space bulky and closed, and if you feel strangled with the current ambience of your space, then you may shift to lighter curtains and blinds. These curtains allow more natural air to circulate not only in the living room and also in the other parts of the house, and they also do not block the sunshine from passing through.